Samsung has just unveiled its brand new Galaxy A devices, the Galaxy A80 (previously rumored as Galaxy A90) and Galaxy A70. The Galaxy A80 is the more higher end of the two, and it’s also one of the most interesting Samsung phone of late. The Galaxy A80 is the first Samsung phone to feature a slider design, and it’s also the first phone to have a rotating camera in a slider design. The highlight of the Galaxy A80 is obviously the new rotating cameras. The phone has a triple camera setup, which includes a 48MP f/2.0 primary camera, an 8MP ultra wide angle camera and a 3D depth camera. Now, this camera setup can be used to take some nice selfies. Switching to the selfie mode in the Galaxy A80, the three cameras automatically pop-up from the back of the phone and rotate. 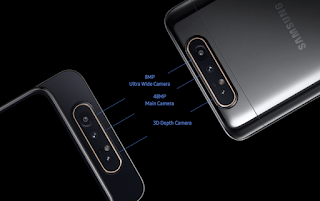 It looks super cool, and it will take you 48MP detailed selfies, ultra wide angle selfies and great portrait mode selfies. Apart from the rotating cameras, the Galaxy A80 has a glass and metal sandwich design, with the display featuring the in-display fingerprint scanner. Talking about the display, the Galaxy A80 features a 6.7-inch FHD+ (1080×2400) Super AMOLED full Infinity Display, which means it’s almost bezel-less, with no notch or punch-hole.